It's been proven that red is one of the most easily-recognized colors in the spectrum. When it comes to tea, we think it's one of the tastiest, too. 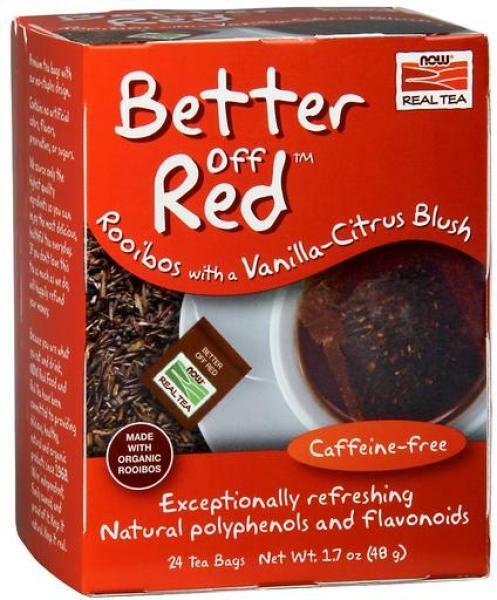 Better Off Red™ is an uplifting concoction of red Rooibos, citrus and just a blush of vanilla. It's packed with nutrients that make other colors envious. Ingredients: Organic Rooibos Leaves (Aspalathus linearis), Natural Flavors, BetterStevia™ organic stevia extract (leaf). Instructions: Steep one tea bag in 6-8 ounces of water that has just started to boil, for 3-4 minutes. Stir occasionally while steeping.